Personal items are those things that may not fit in the uniforms or web gear portion of your impression, but are just as important and can help add a authentic touch. Lucky's are the most recognizable but guys smoked anything they could get including Pall Mall's, Woodies and Chesterfields. 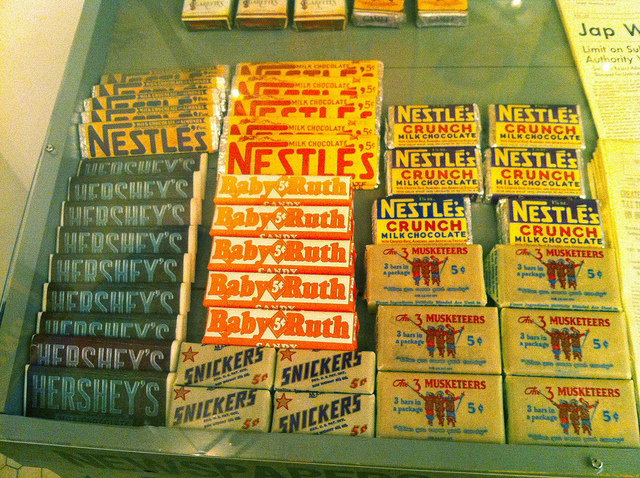 From current cigarettes to reproductions made for display, having some type of cigarette or cigarette things on you is always a good thing. I included this category because sometimes the little parts of the impression are my favorite. Most soldiers were raised in a religious home of some kind and wore reminders of their faith to help keep them safe. A simply soldiers cross (that modern US military still wear) to a Rosarie or a Jewish Cross for members of the Jewish faith are all accurate examples of what most guys would of had. St. Michael Medallions are also a big item, being the patron Saint of soldiers, were considered good luck. Last, but not least were things like sweetheart bracelets. 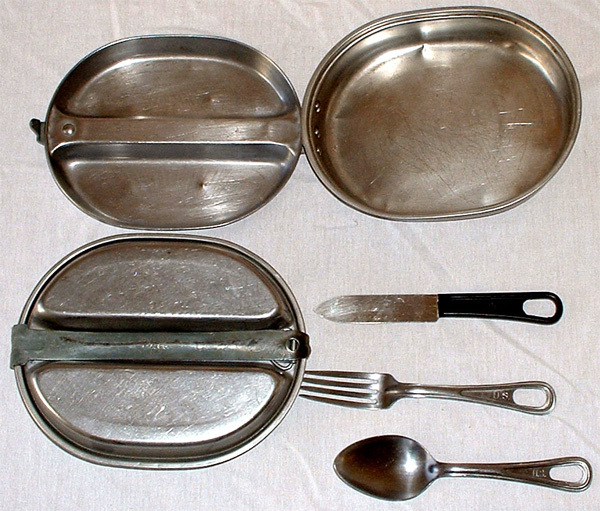 These reminders of home or branch of service usually had a symbol on the front and a serial number or a message on the back. Dog tags almost belong in the required category because they are inexpensive to purchase and every soldier would have had them on at all times. For a true immersion experience for your event, consider making your own rations or purchasing some from many different vendors online. 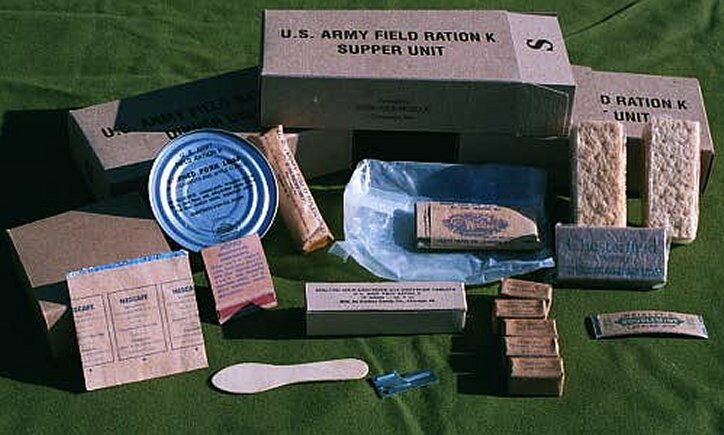 The picture above is from WWII Rations Technologies and I consider them to be one of the best and complete Ration kits for those re-enactors who like to purchase. Click on their name to visit their site. I like to try and make my own and you can find templates all around the web. The biggest collection that I have found recently has been WWII Paperwork and Projects on Facebook. They are a closed group, but simply submit a request to join and you have access to not only amazing templates but also a extensive network of guys who love to make their own stuff and can tell you how to do it. From fancy ration boxes to simply cans with printed labels or reproduction beer and wine. You can really make this custom on what you would like to bring. Caution: reproduction beer tends to mysteriously disappear around Airborne Troops. The bottom line is do some research and get creative. 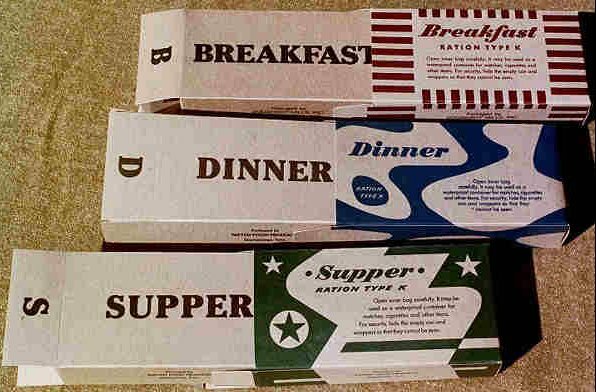 For not a lot of time and a little bit of time, you can really take your impression up another notch by bringing your own rations, displaying them for the public to see and eating them during chow time. Hungry? Grab a period correct snack to munch on. See a pretty dame walk by? Do what Babe Hefron and Wild Bill Guarnere would do and give her a whistle and offer her a sweet treat. For places where we can make a foxhole (either in the dirt like Rockford below or making one above ground with sandbags), we really like to go the extra mile and chuck the used items outside of the foxhole. While you might cringe at the thought and look of the "garbage" outside of the foxhole, many vets love the way it looks. Soldiers lived in them for stretches of time and didn't burn or bury everything they consumed. When the event is over we do police our area and return nature or the land we are on to its original state. America's favorite past time went to War with the troops and more than 500 major league players swapped flannels for khakis during World War II, and such well-known players as Hank Greenberg, Stan Musial, Joe DiMaggio and Ted Williams served their nation off the diamond. In addition many military Units and Regiments put together their own baseball teams complete with uniforms and professional gear to compete against each other. Many troopers brought their own baseball gloves and gear to pass the time. An inexpensive glove can be found online or at your local antique shops and any well worn baseball is acceptable. During the years of World War II the American military saw a rapid expansion of its system of military bases as the number of young men skyrocketed through enlistment and conscription. Many of these included former collegiate and professional stars of the football gridiron. Some 19 active or former players of the National Football League would ultimately die in the American war effort, in addition to an uncounted number of former collegians. "Football is a body-toughener. Football lights the fighting spark in fighting men. It develops aggressiveness, teamwork, stamina, physical and mental coordination under active stress, and therefore it holds a foremost place in our national wartime training program. Teams by the hundreds are in formation at various Army camps and posts and Navy bases. The greatest participation in the history of the sport will be entered in the records of 1942." Beginning in the fall of 1942 the War Department began to promote organized football exhibitions involving select teams from its military bases which played full schedules against the depleted squads of regional universities. See below program of the Iowa pre-flight vs Purdue program. The 101st Airborne also got into the action with it's own football teams. Initially the squads were divided into the individual regiments with the now famous face off scheduled for December 1944. Sadly the games were never played at that time due to the German advance and the start of the Battle of the Bugle. The 101st did get football games during the war years with the programs for the Champagne Bowl vs Sky Train and the program for the 101st vs the Rail Splitters. 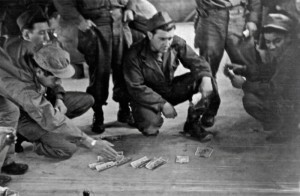 Gambling has been a part of a soldiers life since fighting was first thought of and WWII was no different. 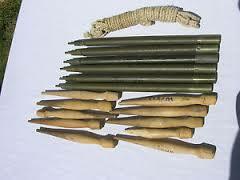 American troops during WWI discovered blackjack and craps games and brought them home after the War. These became huge hits across the country during the bootleg and speakeasy eras. WWII continued this trend of easy to play, high stakes games to relieve the boredom of barracks life or stress of combat. The cards at left were provided by the Red Cross and issued by Aviator playing cards. While many originals exist, a reproduction one can easily be made for use at events. A side note was that playing cards sent to POW camps sometimes contained pieces of escape maps in between the paper of the cards. When assembled it gave the troops a detailed map of the area to assist any escape plans. The makers of Monopoly game also provided games filled with hidden tools and compasses throughout POW camps and was said to have aided up to 35,000 troops to escape during WWII. What is craps or street craps? - Per wikipedia, Craps is a dice game in which the players make wagers on the outcome of the roll, or a series of rolls, of a pair of dice. Players may wager money against each other (playing "street craps", also known as "shooting dice" or "rolling dice") or a bank (playing "casino craps", also known as "table craps", or often just "craps"). Anytime one sees a collection of troopers all gathered around the ground with money, they were most likely playing craps. All the fellas needed was space to roll, some dice and cash. I prefer some yellowish or beat up dice to give that old school look but any dice will work. Craps was even portrayed in the movie The Longest Day (middle pic below), where a paratrooper wins 5,000 dollars on the eve of the D-Day jump. I challenge you to get some basic rules together and play some craps at your next event and hopefully even with the public around. With all this talk of gambling where does one get money to take this to the next level? 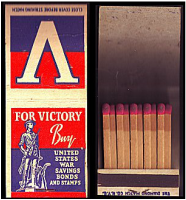 Allied Military Currency ("AMC") was a form of currency issued by the Allied powers during World War II, to be issued to troops entering liberated or newly occupied countries, as a form of currency control. Five Different types were issued: German, Austrian, French, Italian and Japanese. They were issued in varying denominations and some are listed below. Also popular to use are the US printed Dutch guilders. Many copies exist on the web for templates to print your own or purchase and are a great thing to have with you as a re-enactor. From gambling to having in an old wallet or money belt, they add a great level and are inexpensive to make or purchase. SPECIAL NOTE: As the Allied Military Currency were once issued as legal tender, it would unlawful and incredibly dumb to try to pass reprinted money off as real funds. You may get yourself a visit from a black suit government work for your foolishness. This is funny money only. Paperwork, paperwork and paperwork are common grumbles in the Military and WWII was stacked high in forms for nearly anything you can think of. Guys can easily make their own from piles of templates on the web or purchase for inexpensive prices. Most popular things to have are life insurance certificates, motor vehicle permits, Enlisted man's passes and Jump Certifications. Letters and V-mails were a constant source of motivation for troopers in WWII and every conflict. 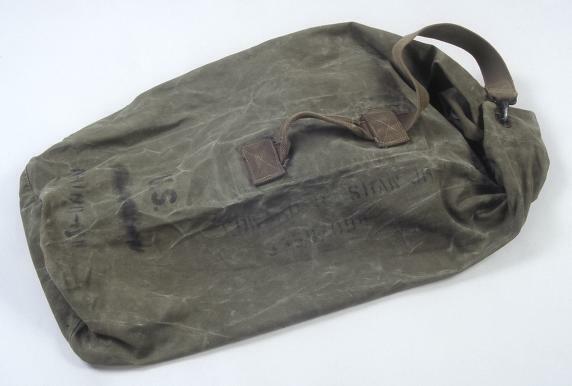 From knowing about the usual gossip, a love letter from your special gal or keeping tabs on your friends and families, guys always begged to receive letters or packages to keep them going and have a piece of home to take with them. Our Unit likes to create our own letters for events pass them out to guys. They look great when reading them in front of the public and work well in footlockers or pockets. A quick google search should yield some pdf's of a V-mail template or a letter with postage like the one below. Get creative and have some fun with your buddies. Before computers, tablets, phones, TV's and the internet, people loved to read to pass the time (not saying that people don't in today's world) and it was a common occurrence to find a troopers wrapped up in a book when not on patrol or on guard. From books that came out around WWII like For Whom the Bell Tolls by Ernest Hemingway, The Grapes of Wrath by John Steinbeck to your favorite writes from the 19th Century like Mark Twain, Jack London, Ralph Waldo Emerson, Edgar Allan Poe, Walt Whitman, Henry Wadsworth Longfellow, take a book with you. The great news is that a lot of classic books are available to purchase and once your remove their fancy sleeve they appear the same as a vintage book. 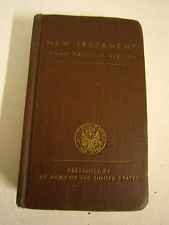 Also popular was the New Testament with FDR letter at the beginning or copies of FM manuals for those late sessions when sleep won't come or prepping for 1st Sgt's inspection as those require both prayer and brushing up on your Basic Field Manual. Above we have gone over many, many, many ideas, items, accessories and products to take your impression to the next level. Where does a trooper keep all of them for display in a accurate way you say? Footlockers of course. Below is what I consider to be the Bible reference manual from Hardscrabble farms Jeff Reed. Click the picture to be taken to their site for a detailed breakdown of the items. It has a great framework of stuff to collect and ideas to get your started. If you don't know your sh!t from Shinola, I would advise to give it a visit. I will usually take 2 footlockers with me at events. 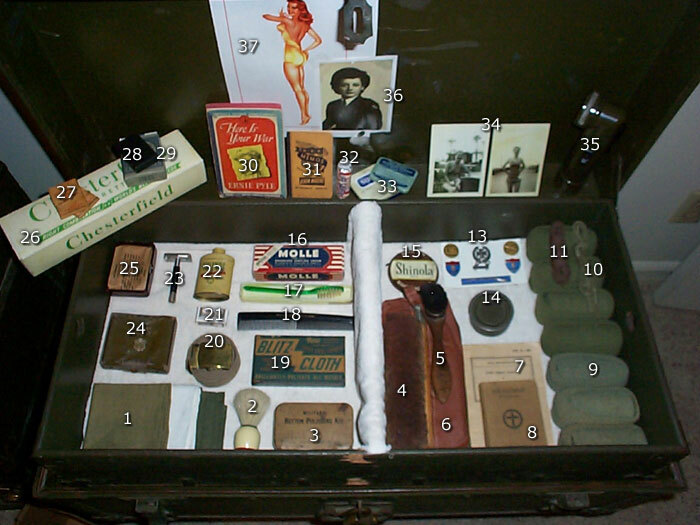 One to do a similar display as above and another to display the display the other personal items to show the public. Depending on the event or far I have to travel, I may do a hybrid of the items to show. Below right, I was able to use a site's glass case (to keep little hands off my items) and did a display in the case with 2 footlockers in addition. A footlocker is a great conversation piece and one that most people don't take the time to put together.